In this project we combined the BBC micro:bit beginner development board with an Arckit construction set and got some cool results. If you're not familiar with Arckit you can read our detailed review. Arckit is recommended for age 10+ and the BBC micro:bit was given out to 11-12 year old children in the UK so they're a good match. The BBC micro:bit is a programmable electronics board with a grid of 25 leds. It has 2 buttons and 3 easy accessible input/output pins plus more available via a breakout board and is packed with sensors. 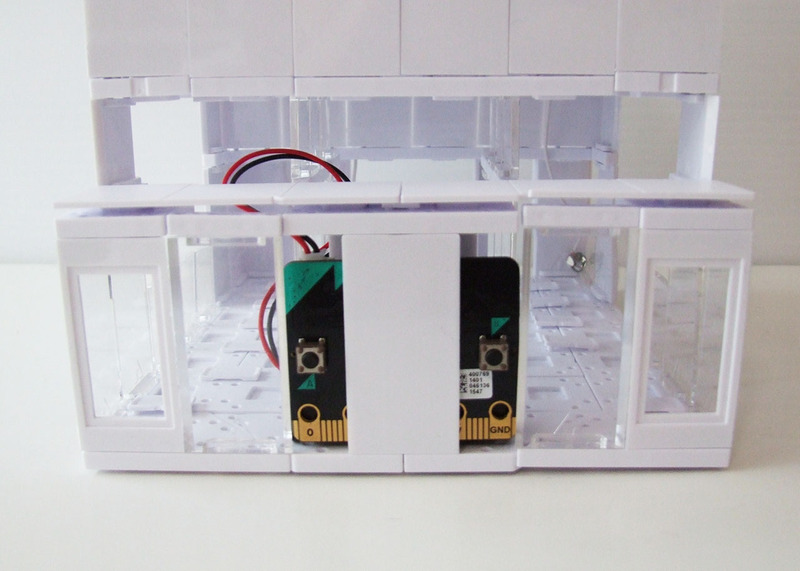 It's small size makes it ideal for integrating into Arckit buildings to add electronics. We found that the LED grid on the micro:bit is about the same width as an Arckit wall panel. If you place the micro:bit behind a wall panel it nicely diffuses the LED lights if the room isn't too bright. You can display images and scrolling text across the micro:bit and have them show through a micro:bit wall. You can also place the micro:bit behind a clear Arckit wall panel which will allow all of the light through. We added a scrolling message to our micro:bit: "Arckit". The buttons are easily accessible from either side of the panel so you can create interactive electronics for an Arckit building. Cool! The micro:bit can be powered via USB from a computer when you are programming it or via a battery pack. We used a battery pack for this project to avoid cables. We built a housing for the micro:bit which can be removed to change the batteries (or reprogram via USB) and easily slotted back in. We adapted the back of the building we used for our Circuit Playground with Arckit project. 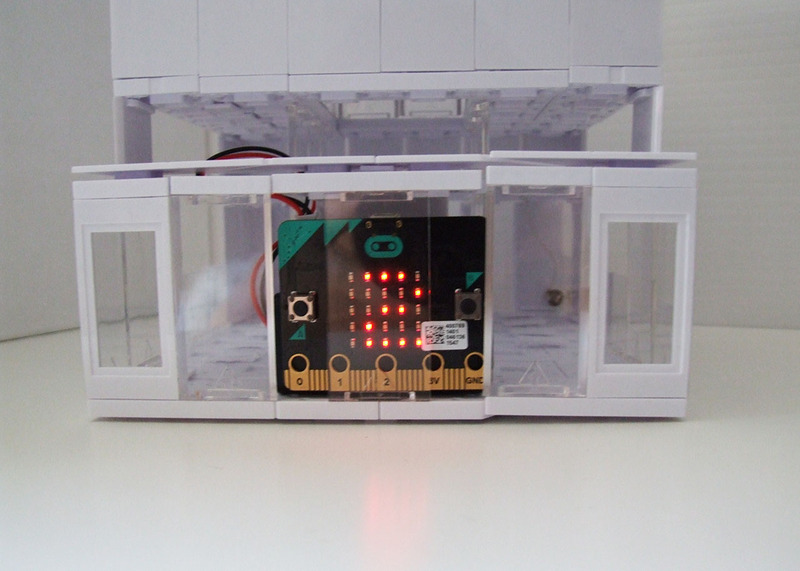 You can view and use the code for our Arckit micro:bit project. The micro:bit has built-in temperature and light sensors. We programmed the micro:bit B button to display the current readings. In future we'll use the sensors to add home automation functionality to our Arckit building. You can program the micro:bit remotely via Bluetooth using an iOS or Android app. This means that you don't need to remove the micro:bit to reprogram it. 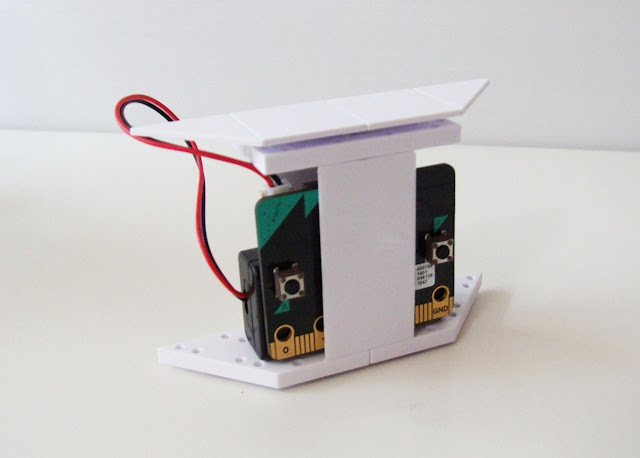 Two micro:bits can interact with each other so it's possible to control a micro:bit remotely. The micro:bit allows you to connect electronics easily to its three input/output pins. This can be used to connect additional sensors and buttons and control LEDs and Neopixels. For more accurate readings you could add external light and temperature sensors. There's also a slimmer mi:power coin cell battery add-on available which would take up less space and which has a buzzer built in which makes lots of sense. 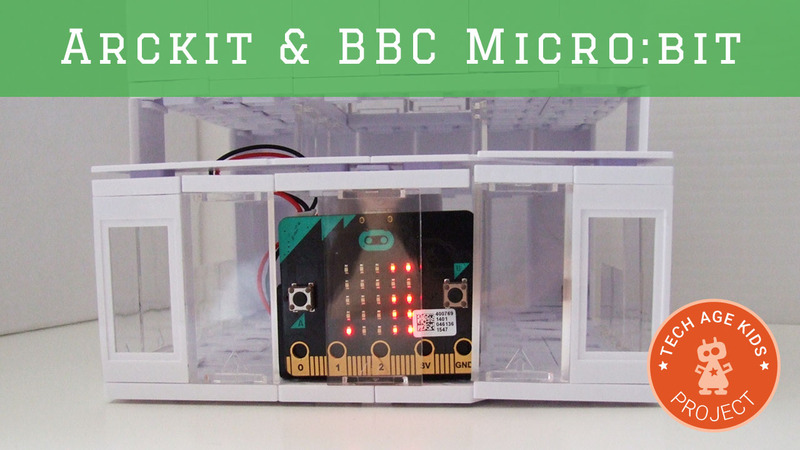 We're pretty excited about the possibilities for using the BBC micro:bit with Arckit for STEAM projects. There's so much you can do to explore the Internet of Things and automated home projects including energy saving. The small size of the micro:bit makes it a great fit (literally!) for adding to Arckit buildings. The micro:bit only having 3 input/output pins easily accessible is a bit of a limitation but as we've seen there are ways around this. The micro:bit is a capable little device!